Ok, so I know I’m not a veteran or anything, but I have a few pieces of advice to pass on. Really, a few pieces of baby gear to pass on. A few things I couldn’t live without…. I was scared to put R in this at first because she was having some breathing issues, but it is a true Godsend! I have a few other swaddling blankets which are fine, but this one is my fave. I do use some other ones that have a slit for the swing buckle during the day, though. This is thing is pretty cool. I like that you can put the carseat on it when you get home. Really, any swing would probably do, but this one is cream of the crop. I didn’t think I would be a fan of baby wearing but I am. Super productive. I feel like I am neglecting my child when I lay her down all day when she is sleeping (which is about all day still). With this, I can get stuff done and bond at the same time. I am wearing her right now. 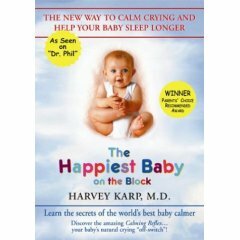 The Happiest Baby on the Block DVD. I literally giggled through this whole thing I was so excited. We only watched it a few days ago, but so far we have had great success with it! We had a few days there where I was concerned about my sanity. R just seemed unhappy. Not crying, just unhappy. I thought it was me (of course) but the methods in this vidoe not only work but they make sense! I think this and the miracle blanket are going to be my standard baby shower gift from here on out. Still living in baby bliss….. Categories : baby stuff, R.
i would have made it thru sofia’s first 12 weeks without the miracle blanket! and i love the happiest baby dvd. another great piece of gear is the babybjorn ‘baby sitter 123’. it is the best!! The car seat is lovely but i don’t understand how the swing works. I would like to see the site which sells it . Can you share? The blanket too, it looks kinda of different from what I usually see. I’ve never tried any of those products and they all sound very cool!!! Gosh it’s been 3 weeks already?!?! She’s gorgeous, by the way. I’ve been reading along the past couple of weeks but not finding time to comment until now. Anyhow, we had all 4 of these (except we used the Karp book and never saw the DVD but the book was just as great) and I’m glad they are working for you as well as they did for us! All great products! we reccommend the glass Dr. Brown’s bottles, as well. Both Josiah and Annie have used them and we’ve never had problems with colic or inner ear infections (the company claims to prevent both). Plus, they’re naturally BPA free! Worth a look! 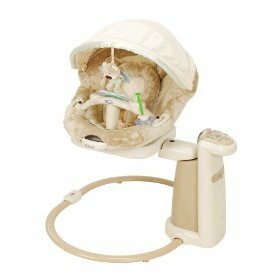 I told my hubby a few months back when we find out we are going to be parents again, I want one big thing, the newborn soothing center. I am so glad to see someone that is using it. It would have helped out so much with our first. She slept in a carseat put in a vibrating crib for a year due to reflux and just wanted to vibrate while she slept. This would be so much easier. I’ve heard great things about the DVD/book. I’m making mental notes about all of the other products. I’m planning on doing the baby wearing…already have my wrap. Just need the baby;) I can’t believe it’s been 3 weeks. Hope everything is going well!